The glass is an important engineering material for a number of different applications. Laser machining of transparent materials, such as flat glass, is a fast growing market, driven by new developments in displays, optoelectronics and medical device technology. Conventional glass processing techniques such as diamond drilling and dicing, water-jet drilling, sand blasting or ultrasonic processing are still commonly used in mass production, although limitations of these techniques in flexibility, processing speed and quality require a search for novel technological solutions. 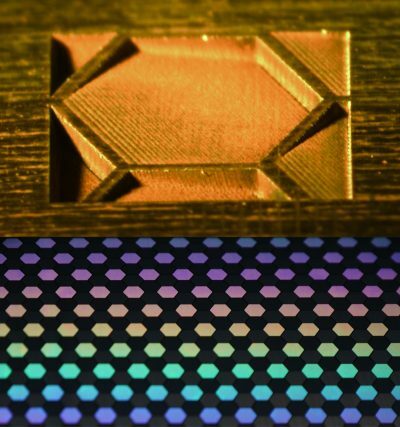 Laser-based techniques such as rear side glass processing can offer high quality and throughput, which can be used for glass drilling, cutting and milling applications. Typical kerf widths with such technique can be extremely reduced compared to mechanical diamond tool processing. 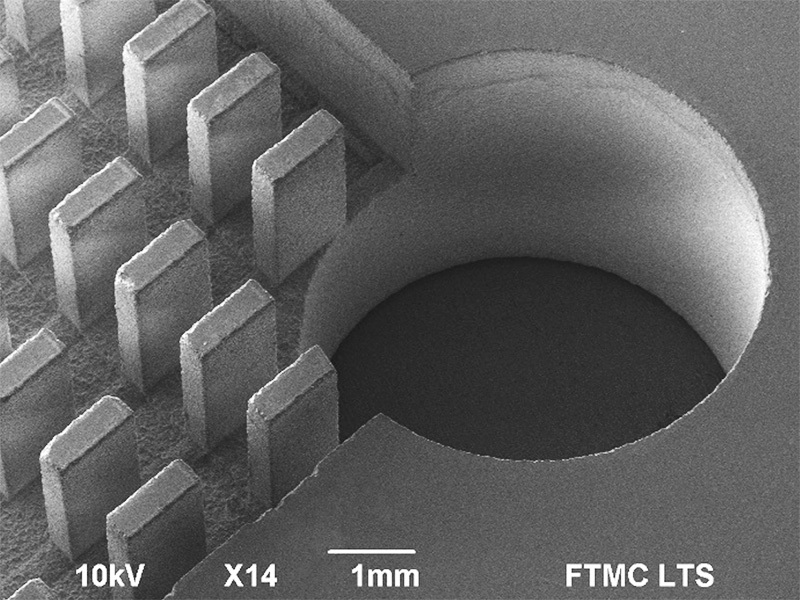 Therefore, laser milled feature sizes can be reduced to 150 µm. Furthermore, laser cuts are taper–less, therefore, extremely high aspect ratio features can be fabricated. Glass surface chipping during processing is another important issue. However, laser-based processing with Atlantic series picosecond laser can maintain high throughput with the highest processing quality keeping surface chipping bellow 100 µm. Material removal rate: 90 mm3/min. Medical tools and other devices made of stainless steel (SS) require laser markings for unique device identification (UDI). These markings need to be corrosion resistant in order to withstand numerous autoclave cycles. The Atlantic 6 laser shows excellent results in color modifications of stainless steel. The shade of stainless steel can be lightened or darkened by controlling laser power and scanning speed of the beam. The resistance of the laser marked areas to the corrosion was tested by using the salt spray test according to the international standard (ISO 9227), and the marking can withstand extreme environmental conditions, and is absolutely rust-proof. Single crystal sapphire offers superior physical, chemical, and optical properties, which make it an excellent material for wide range of applications. However, the high cost of sapphire machining precludes its use in all but the highest value applications. Stealth dicing technique using Atlantic 6 laser is a solution that ensures the best quality and cost minimization. 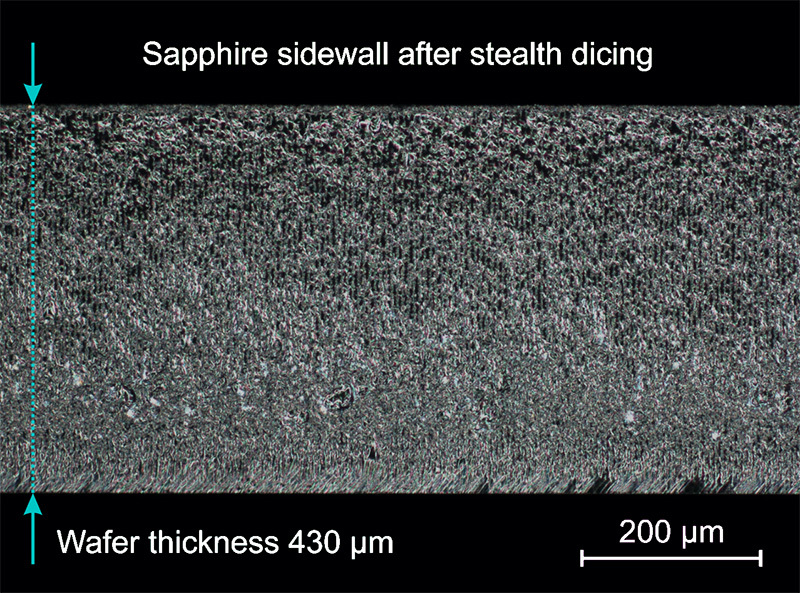 Using this method, laser induced modifications are created inside the volume of sapphire without damaging the top and bottom surfaces of the substrate, even in thick wafers. 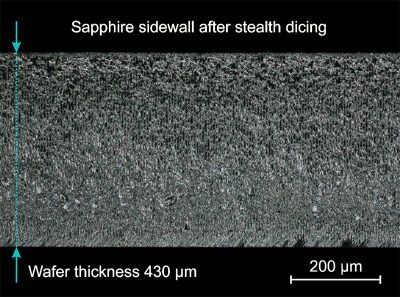 The modifications create a crack plane and sapphire is cleaved by applying external force, resulting in a clean process with almost no material loses because of effectively zero kerf width. Some applications include: high-speed integrated circuit chips, thin-film GaN-based light emitting diode substrates, wristwatch crystals and movement bearings, scratch resistant display and camera covers, and high durability optical windows for extreme applications.